Integrating morphological studies with DNA barcoding is indicating significantly higher species diversity than previously known in the polychaete families Goniadidae and Glyceridae (Glyceriformia) from the Western coast of Africa. Our multi-toothed acquaintance from a previous blog post makes an appearance here, together with a multitude of other species. The animals were initially identified to species or genus level using available literature with keys or morphological descriptions. Several specimens did not match any species description and may be new species. For each recorded species, a number of specimens were selected for DNA barcoding and uploaded into the BOLD database. You can read more about how this work was carried out in this blog post from when guest researchers Lloyd and Williams visited in November 2015. Our preliminary findings were presented as a poster at the 12th International Polychaete Conference in Cardiff, Wales during the first week of August. You can read about the University Museums attendance here. Next we are hoping to invite one of the taxonomic experts on the group to come visit and work on the material – there is certainly a lot to be done! The poster presented at the IPC2016. Click to enlarge! 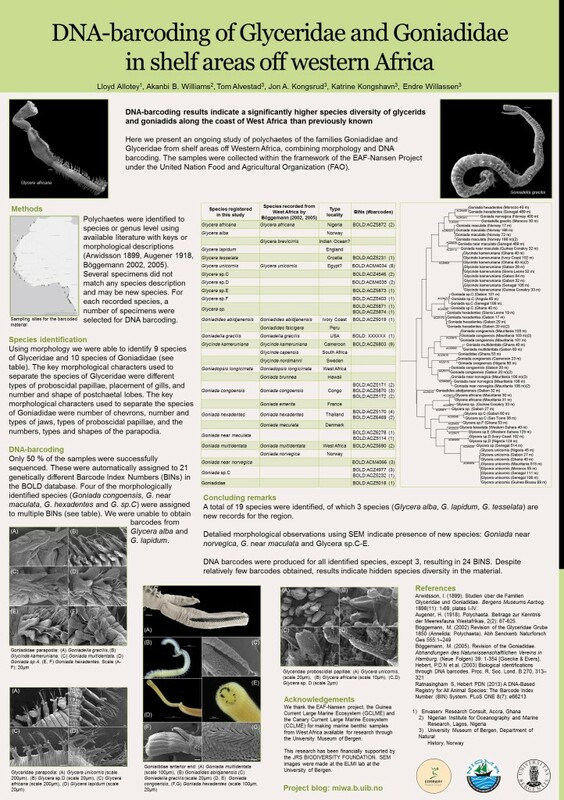 This entry was posted in BOLD, Guests, MIWA, Polychaeta, species identification and tagged @IPC2016, #IPC12Cardiff, Barcoding, Glyceridae, Glyceriformia, Goniadidae, International Polychaete Conference 2016, Polychaeta, species diversity on August 30, 2016 by katrine. Management of species requires information about their habitat, ecology, population size, geographical range, exploitation and environmental threats. It usually should go without saying that confident species identification is a key factor in the acquisition of such knowledge. DNA barcoding may help to establish a relative objective identity tag on taxa and to place local and regional populations in a global context with their closest relatives. We recently published a paper about a species of Cellana that is closely related to C. toreuma in the Indo-Pacific. More research is needed to assess if the Gulph of Guinea population is a separate species or a population with relatively recent connections to the Indian Ocean. This entry was posted in BOLD, MIWA, Mollusca, species identification on August 7, 2016 by EW.